An outdoor kitchen can be the most loved part of your home. Outdoor kitchen planning can be a real chore. Getting from concept to completion can be a simple process if you plan your project carefully. When you undertake any home improvement project, you should carefully consider your options. There are countless design professionals, builders, remodelers, and contractors that will offer their expert opinions, but ultimately YOUR opinion is the only one that matters. After the dust settles and you’re left to enjoy your new outdoor living space, you need to be happy with your choices. These five questions will help you plan your outdoor kitchen project with success. Question 1: What am I really going to cook? If you walk into a pizza parlor and tell them you’re hungry, guess what they’re going to try to sell you? A pizza of course. If you walk into a grill store and ask for help with your outdoor kitchen, guess what they’re going to try to sell you? Their most profitable grill. That’s pretty much the way America works, so don’t be upset with the proprietor. First, ask yourself what you are really going to cook. A premium grill carries a premium price tag, so don’t overpay for options you don’t need. If you don’t plan on cooking rotisserie chicken, don’t get an expensive grill with a rotisserie. If you think you’ll like pizza more than steaks, consider adding a pizza oven, or perhaps a kamado style cooker that can cook pizza or steaks. If you don’t think grilling or cooking will be a big part of socializing outdoors, perhaps skip the grill entirely, or just get an inexpensive cart model grill for the occasional cookout. Question 2: Where are my guests going to sit? Or more appropriately, where are you going to sit? An expensive patio set with seating for six might not be as popular of a hang-out spot as a shady spot under a tree. And your pristine bar built directly behind your smoky hot grill will definitely be less popular than either of the two locations mentioned before. If you look at many preconfigured grill islands available today, you’ll see examples of bar seating directly behind the grill. Don’t treat your seating as a checklist. Of course, consider the comfort of the seat. The coolest looking chair, even if it matches your deck perfectly, won’t mean a thing if it is physically uncomfortable. Question 3: What will we look at? When you plan your layout, consider where you and your guests will be aimed. If you have young kids and a swimming pool, you had better plan on facing the kids. If you don’t plan for this, your guests will all rearrange your furniture for you and move the patio chairs where they like. If you have gorgeous landscaping or some other natural feature, don’t let it be the backdrop, let your guests look at it. Question 4: Will I be able to get replacement parts? Anything you add to your house, inside or out, has the chance of getting damaged, stolen, or simply worn out. Don’t be fooled by flimsy warranty offers, ask yourself what will happen if you need a replacement part. If you buy a patio set from a discount retailer, and your seat rips, will you have to reupholster your entire set because that is a seasonal item that won’t be carried indefinitely? Sometimes the initial cost savings may be worth the risk of having a difficult time getting replacement part. 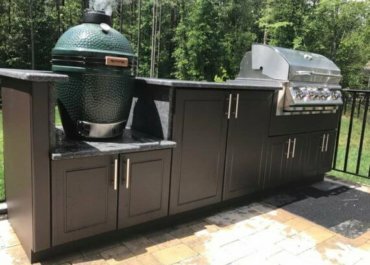 When you plan your outdoor kitchen, you want to make sure you pick suppliers with a stable track record that have the ability to provide replacement parts should something unforeseen happen. If you hire a craftsman to build a one-of-a-kind, just make sure you’re comfortable with getting a part rebuilt that will match the rest of your project when it needs repair. Question 5: What happens to the space at night? Obviously it will get dark at night, but what will that do to the ambience of your outdoor area? Walkways get dark along with the rest of the surrounding. Adding landscape lighting to add safety and ambience to walkways can be an inexpensive fix. Strategically placed outdoor lamps can keep your guests from dining in the dark. Planning a receptacle near your grill will give you the option of adding more powerful lighting to your cooking area. Even adding a fireplace or water feature can go a long way toward adding soothing sights and sounds to your outdoor space once the sun goes down. Make no mistake, your guests will not want to sit in a creepy-quiet, dark yard at night, even if you have a ten thousand dollar grill nearby. A hundred dollars of lighting can do more for making your backyard a pleasant hangout spot than any outdoor appliance can. Many of these questions seem obvious, or perhaps even silly to ask yourself. But before you sign off on a big backyard makeover, or even a small one, go outside with these questions in hand and really consider your space. The time to review these details is before you sign any contracts, not after. While anything can be undone that you don’t like with regard to your backyard plans, that won’t happen without cost. You’ll be happy you considered these items during the outdoor kitchen planning portion of your project.